Are you in New York? What are you doing this week? Hackaday is having a party on Wednesday evening. come on out! How about a pub in Cambridge? Hackaday and Tindie will be there too, on Wednesday evening. It’s a bring-a-hack, so bring a hack and enjoy the company of your fellow nerds. If this goes late enough we can have a trans-Atlantic Hackaday meetup. Portable emulation machines are all the rage, and [Pierre] built one based on the Raspberry Pi Zero. It’s small, looks surprisingly comfortable to hold, and is apparently it’s fairly inexpensive to build your own. For the last year or so, the Raspberry Pi Zero has existed. This came as a surprise to many who couldn’t buy a Raspberry Pi Zero. In other news, Ferraris don’t exist, and neither do Faberge egg omelets. Now, the Raspberry Pi shortage is officially over. They’re in stock everywhere, and we can finally stop listening to people who call the Pi Zero a marketing ploy. No Starch Press is having another Humble Bundle. Pay what you want, and you get some coding books. They have Python, Haskell, and R, because no one should ever have to use SPSS. [Reg] wrote in to tell us about something interesting he found while cruising eBay. The used and surplus market is awash in Siemens MC45/MC46 cellular modem modules. They’re a complete GSM ‘cellular modem engine’, with an AT command set, and cost about $10 each. Interfacing them with a board requires only two (strange) connectors, SIM and SD card sockets, and a few traces to through-hole pads. Anyone up for a challenge? A breakout board for this cellular modem could be very useful, should someone find a box full of these modules in a surplus shop. On this page, about halfway down the page, is an LCD driver board. 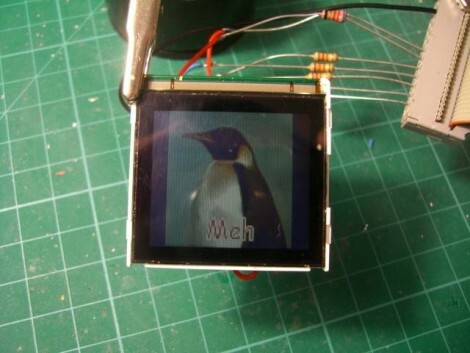 It turns a video signal into something a small, VGA resolution LCD will understand. This driver board is unique because it is completely hand-made. This is one of those small miracles of a soldering iron and copper clad board. If anyone out there is able to recognize these parts, I’d love for you to attempt an explanation in the comments. A few weeks ago, the RTL8710 WiFi module showed up on the usual online marketplaces. Initially, we thought it was a competitor to the ever-popular ESP8266, offering a small microcontroller, WiFi, and a bunch of useful output pins. A module based on the RTL8710, the RTL-00, is much more than a competitor. It’s pinout compatible with the ESP8266. This module can be swapped into a project in place of the ESP-12, probably the most popular version of the ESP8266. This is genius, and opens the door to a lot of experimentation with the RTL8710. As with all our extracurricular adventures, we needed to visit a few hackerspaces while in Munich. The first one was MCSM/Make Things Munich, formerly the Siemens Club for model engines. We’ve been to a few hackerspaces and have the passport stamps to prove it, and we can say without a doubt this space is unique. MCSM was a hackerspace before the concept of hackerspaces existed. Originally, this was the Siemens Club for Model Engines, filled with engineers from the Siemens plant tinkering with model trains, model boats, and models of anything that moves. One of the members that guided us through the space, [Carlos Morra] told us when he joined, he alone dropped the average age of the space’s membership by a decade. Inside the space, you’ll find the usual tools and equipment – lathes, CNC mills, an electronics workbench, and a bunch of old but still valuable equipment. Most of this equipment was salvaged from the Siemens plant. The organization for this space, though, cannot be compared to anything I’ve ever seen. There are floor to ceiling cabinets filled with everything you can imagine, all carefully indexed and sorted. Of course, being formerly called the Model Engine club, there will be an immense train layout. I counted at least five gauges of track in two sprawling layouts, one of which was easily 15 square meters. It’s a true hackerspace built from a model train club, how can it get better than that? [Neil] is driving this Siemens A60 LCD using a parallel port on his Linux box. He likes this module because it has an integrated LED back-light, controller IC, and the pads are large enough for a human to solder. He notes that the screen runs on 2.9V, which matches the forward voltage of the LEDs used as back-lights. This means it is possible to use one f the LEDs as a shunt to drop incoming voltage down to a safe level for the controller. In fact, that’s what he did. The data lines are connected to the parallel port along with some current limiting resistors. The LEDs are connected with resistor calculated for maximum brightness, with the output from the LED used as the source voltage for the LCD controller chip.Whether you want to use one of these screens with a PC or something else, the code that [Neil] worked out should provide the information necessary to do so. The Nokia cellphone LCD post inspired [Neil] to send in a tip about this project. If you’ve got well documented hacks that you’re just sitting on why not let us know about them? How do you convince a power company to let you play with their multi-million-dollar wind turbine? Call yourself an artist instead of a hacker! [Michael Pendry] convinced Siemens to let him install this ‘art’ piece on the rotors of a wind turbine outside of Munich, Germany. It features 9000 LEDs, 3000 on each of the 30 meter blades, and can pump out 20,000 candelas when fully illuminated. The problem? The blades of the power generator turn extremely slowly compared to fan-based persistence of vision displays. This makes it more of a “long-exposure” display system that is illustrated in some of their press photos. Ok, so the POV is a bit of a let-down, but the display effects achieved are still pretty impressive.